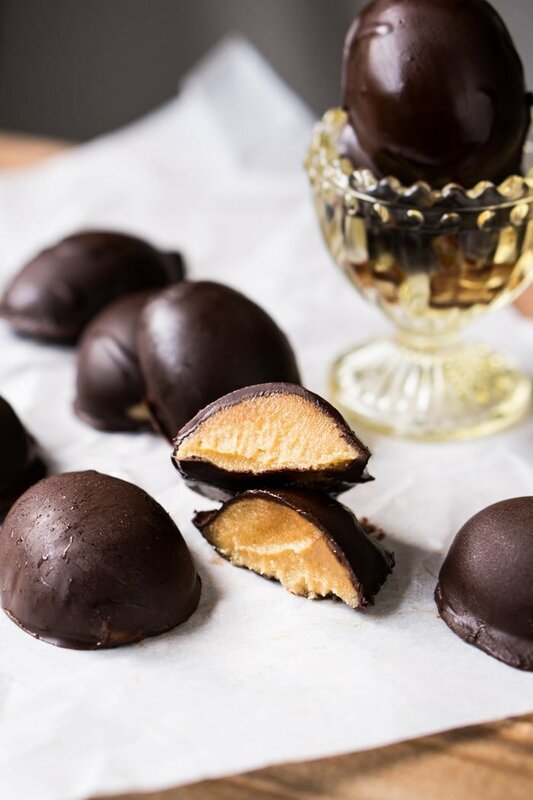 These keto chocolate peanut butter Easter eggs are absolutely scrumptious and a breeze to make! Think five ingredients and just 1g net carb a pop. 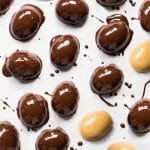 Keto Chocolate Peanut Butter Easter Eggs i.e. fat bombs! Easter season in full swing, and chocolate eggs in all shapes and forms are hitting the shelves. So I thought we’d whip up my favorite Easter candies as scrumptious keto fat bomb treats! With just five simple ingredients, these guys are proof that easy and simple need not be boring. 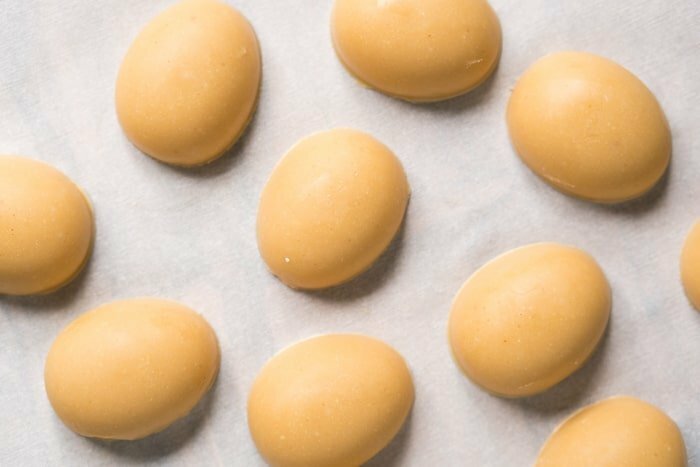 While I generally favor homemade nut butters, these keto peanut butter eggs are an exception as you really want that creamy smooth texture. My suggestion is that you go for an unsweetened and salted variety (I really like the 365 brand from Whole Foods). Whatever peanut butter you decide, just be sure it’s runny at room temperature (i.e. that its natural). You see, the ‘always solid’ varieties have generally had some of the natural fat drained or have added emulsifiers. And if dairy free, taste will be different but coconut butter will also work the charm. Or you can always grab a bag of Powdered Lakanto (just keep in mind its twice as sweet…. or even go for pure monkfruit extract (love Lakanto’s!) or stevia! Add the butter and coconut oil (or more butter) to a large bowl. Cream the mixture with an electric mixer until evenly combined and super smooth. Add the lesser amount of sweetener to start and continue to mix until light and fluffy. Add in the peanut butter and mix until just combined. Check for sweetness and salt, keeping in mind that the store-bought version is on the salty side. Spoon into moulds (or ice tray!) and freeze until hardened. Melt 3/4 of the chocolate in a water bath stirring frequently. Remove from heat and stir in 1/4 of the remaining chocolate until incorporated. Feel free to add a touch of coconut oil to thin it out (depends on which chocolate you use). 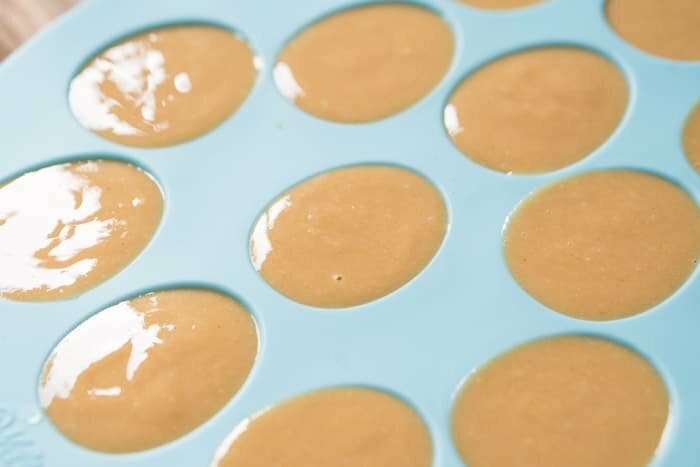 Immediately dip the peanut butter fat bombs until evenly coated. Transfer to a parchment paper lined tray and refrigerate until set. Keep refrigerated for about a week or frozen for a month. *A bit of coconut oil improves the texture quite a bit, without any taste whatsoever. But feel free to sub with more butter. **You can pretty much use whatever sweetener floats your boat. But it must be powdered. So get your blender out, make sure it’s completely dry, and process your sweetener of choice until powdered. Just make sure you wait a few moments for the dust to settle before opening the blender or food processor. If using xylitol, make sure to be careful if you have a pup around the house, as it’s highly toxic to the little guys! Please note that nutrition facts were estimated per fat bomb, assuming a 24 yield. Also keep in mind that nutrition values may vary widely depending on the peanut butter and chocolate used. Just want to let you know that I bought the silicon mold you have linked—it’s huge! I only made 11 eggs with this recipe. The taste is fabulous! I really appreciate all of your recipes. Can you use cashew butter or almond butter instead of peanut butter? Thank you! HI Paola, LOVE your site, recipes and tips and tricks. Thank you so much for taking the time to make your recipes PERFECTION and for helping us with converted recipes for low carbers. SO awesome to hear Leslie! Regarding your peanut butter powder, in all honesty I’ve never tried… but if you’re able to make some peanut butter out of it I don’t see why not? That peanut butter powder is defatted, like peanut flour. You may need to add more fat to get the filling consistency you want. I did make chocolate peanut butter eggs a year or two ago with a filling recipe using peanut flour. But it also included oily natural peanut butter! Hi Ann, I tried the powder and you don’t need to add anything but the water which will make the consistency you want. It is very similar to home made peanut butter. There is no sugar in it so the taste is VERY similar to home made. I suppose you could use oil in it but saw no need too. There is another brand I am going to try also to see which one I like the best. 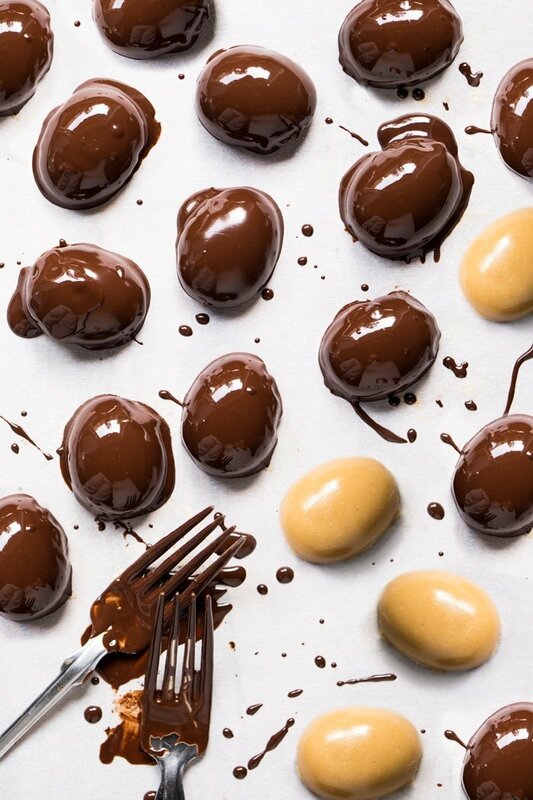 Instead of dipping in chocolate, how about painting or coating the molds first in chocolate, freezing (or refrigerate), then pouring in the PB mixture, freeze again, then painting chocolate on the “bottoms”. A little more involved, but not as messy. Love, love, LOVE, your recipes! Def Jan! 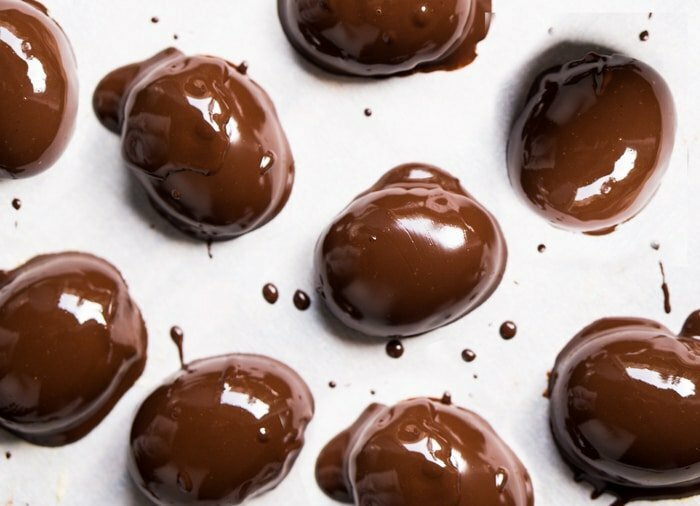 But for me the chocolate shells cracked somewhat when getting them out (you’d need to get hard chocolate molds rather than silicon ones) xo!! I was wondering how this would turn out using hazelnut butter. I have made your “nutella” and absolutely love it. But I don’t get along well with peanuts….I love your web site, thank you for all your wonderful recipes. Could you please tell me the amount per serving. It was not listed on the Nutrition Facts. Hi Kathy, If I may jump the gun, there are 24 servings. In all of Paolas recipes the servings are noted at the top of the recipe where the prep time and other info is posted. So for each serving which is one(1) there is one( 1 ) net carb. LOL so make sure you put them in the fridge before you try, and take only one out of the container 🙂 Hope this helps. Helo Paola! You are brilliant, and the fact that you share so much for free is amazing – thank you from the bottom of my heart. I have one question – It’s very hard to get grass-fed butter in Canada (silly trade rules), but quite easy to get grass-fed Ghee. Do you think that would work for this? I have the same question – can I use ghee butter? Ghee is not an ingredient I work with often, but in all honesty I don’t see why it wouldn’t work! I have made this recipe twice. The first time I had some trouble with the chocolate melting correctly. This time I followed your instructions to the letter and used a water bath to melt the chocolate. That worked. My additions to the chocolate was 1/4 teaspoon of Pyure and about 1/4 teaspoon of coconut oil to made it a little creamer. I used ice trays both times. First time the filling got stuck and I had to pries them out. The second time I sprayed them with oil and they came out great! I used Pyure in the filling also. Only used 1/4 cup and 4 teaspoons. Thanks SO much for this and other WONDERFUL recipes !!! This is about the 10th recipe I’ve cooked from your site, and I must say you’ve got some seriously good taste buds going! I could swear I was eating Reese’s and even the kids agreed. Thank you for being so generous and sharing them with us. We cannot afford to buy all the keto cookbooks, and the one I did buy was such a disappointment after coming across your blog. You have something groundbreaking here, healthy recipes that actually taste good not just ‘healthy good’. Thank you again for all your hard work and generosity Paola. Definitely blushing here Claire! Thanks so much for your lovely comment, very happy to hear you’re enjoying the recipes so much! Xo and happy Easter! These came out AMAZING – the flavors are spot on. Just FYI for other readers, I used 1/2 cup of swerve and 1/2 tsp salt and it was perfectly sweet and savory, just like a Reese’s. One thing – I had a bit of a time getting them chocolate dipped, so they aren’t pretty like yours. Any pointers for technique? I watched the video a couple of times but it didn’t go as smoothly as yours. The chocolate was pretty viscous and the pb started to melt a little. Anyway, they are really, really delicious and so worth making. Thank you SO much for sharing this recipe for my favorite candy. What is a serving size in grams? Hi Stacey! In all honesty I didn’t measure, so I would suggest you add all the ingredients in grams (depending on how much sweetener you use) and divide by the number of eggs you make. xo! I love peanut butter cups. These taste as good or better than the ones from the store. I used coconut butter, and it was so creamy. Hi Rayan! I seem to have missed a bunch of your comments!! But so happy to see that you’re still enjoying the recipes so much 😉 xo and happy easter! I really don’t understand how your recipes always come out MUUUUUUUUUCH better than others, even if they have the same ingredients. Maybe it was the salt and creaming the butter here, but these are by far the best Reese’s copycat recipe I’ve tried. Kuddos! Lol I don’t know!! Magic?! 😜 So happy you enjoyed so much Paula xo!! Hi Angela! Yeah sure, it’ll just depend on the texture of your peanut butter. If it’s solid-ish, just pop the mixture in the fridge until the butter is set again, scoop it out and shape as eggs (easiest done over parchment or a baking mat). I had just made homemade peanut butter, so mine was essentially liquid at room temp and I would’ve had to leave it in the fridge overnight to set. xo! Love these!!! Made them last night and they are all gone. Used cupcake liners in muffin trays and then dipped half of them in ghiradelli chocolate chips because that’s all I had. The other half I left and was going to melt some more chocolate to dip them but they got eaten by the family before I could lol. My son asked me to make some more this morning and said I didn’t even need to dip them. I used a little over 1/2 cup powdered erythritol and will probably do 1/2 cup today. Thanks for the great recipes. My favorite part of your recipes is even if I wing it with what I have they always taste great. Mine never look as pretty as yours though (my donuts were hideous, but yummy). Thank you! That’s awesome Becky! So happy you enjoyed and thanks so much for reporting back in such detail, always SUPER helpful to other readers 🙂 have a wonderful weekend xo! Lol that’s awesome Stella so happy you enjoyed! xo! Hi, I would love to try these but have a coconut allergy in addition to dairy allergy. Can i substitute olive oil in the recipe? Ummm so I don’t know if it’s because I haven’t had a Reese since I’ve been keto six months ago… but I can sweat that these taste JUST like the real deal! I did add a bit more sugar, I think about 2/3 cup to make them more Reese-like and they were divine! I just made the normal Reese’s cups in some silicon molds I have. Lol that’s awesome! So happy you enjoyed them Jess! I LOVE how many recipes you guys crank out! I’m in love. Happy Easter! I cannot believe how amazing you and your site are! I love this idea and need to make these. Do you happen to have a link to the moulds you’ve used? Hi Linda! I have included a link to similar silicon molds available on amazon (they have an even more pronounced egg shape than mine!). So happy you’re enjoying the recipes 🙂 xo! Thank you so much, Paola! Apologies if I missed that the first time around. It wasn’t there, put it there upon your request 😉 xo and good weekend!